After their latest release Dead Man's Voice, THE NEW ROSES who already belong to one of the most promising and successful hard rock acts the heavy rock scene has to offer, and within two years only this rock juggernaut fronted by charismatic vocalist Timmy Rough have played more than 250 shows all over Europe. Some of their highlights have been live performances at the UEFA Champions League Festival in Berlin, shows at the Hamburg and Swiss Harley Days and being special guests on tour with acts such as ACCEPT, TREMONTI, Y&T, SAXON and THE DEAD DAISIES, to name just a few. THE NEW ROSES are about to return with their brand new album One More For The Road, set to be released August 25th on Napalm Records, and it will surely mark the band's heaviest, most catchy and emotional record to date! Having played live that much over the past two years, THE NEW ROSES manage to transport their intense live spirit also on record and with their upcoming album share the feeling of stepping into endless freedom. Now the band has released a brand new video for the track "Every Wild Heart", get some in-depth views behind a life on tour and follow them on the road to their recent show at Hellfest on KNAC.COM HERE. Says the band: "Playing at HELLFEST was a blast, this place is full of wild hearts and Rock'n'Roll and we're so happy to share these impressions with our fans now in the first video of our upcoming album called 'One More For The Road'!" "Dancing On A Razor Blade"
"Life Ain't Easy (For A Boy With Long Hair)"
"Piece By Peace Of Mind"
Available on CD, LP Gatefold or as Digital Download, you can pre-order One More For The Road right HERE. 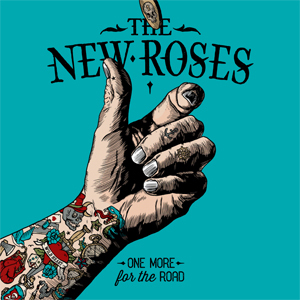 In support of their new album, THE NEW ROSES will be of course heavily touring this year again! The "One More For The Road" tour, presented by Rock Hard, Rocks, EMP, Metal.de, Tätowier Magazine and Stormbringer, as well as Radio B.O.B. and Star FM, will kick off on September 29th in Aschaffenburg, Germany.